An Alternative to an Overhead Door. The Weather Stop curtain system is designed to close in large doors and openings on open front barns, commodity buildings, storage sheds and pavilions. The fabric used is permeable allowing some air movement while maintaining a minimum level of ventilation. Due to the style of the fabric with small openings, rain and snow will not be allowed to penetrate and enter the building providing a protective barrier for the building’s contents. The Weather Stop curtain system uses gear drives to roll the curtain up and down allowing easy and clear access into the structure when needed. The fabric is a proprietary-anti unravel knitted polyethylene with a high level of UV protection made for long life. 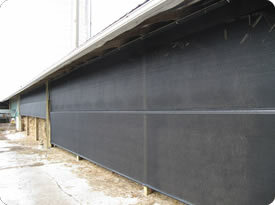 The Weather Stop curtain system is available up to 20ft (6m) high. Weather Stop is an excellent alternative to overhead doors. Also used for pavilion and gazebo wind breaks. Does not restrict access when it is completely open. Does not restrict vision when inside.